After an extended period of time when the stock market seemed to be moving just straight up, traders have been reminded that volatility is possible and could result in a large and sudden loss. The chart below shows that stock prices rallied for months before declining suddenly. The rally began in November 2016 and traders enjoyed a market that failed to pull back by as much as 5% until this month. That was a record period of time without a 5% pull back and the fact that it ended suddenly probably should not have been a surprise. Some old traders like to say that the markets job is to fool the maximum number of traders possible. In this most recent case, the market action lulled at least some traders into a sense of complacency. There seemed to be some traders who believed volatile market action would provide a warning before it occurred. We know that from the fact that more than $1 billion was invested in VelocityShares Daily Inverse VIX ST ETN (NYSE: XIV), a product designed to increase in value as volatility declined. For an extended period of time, XIV delivered steady gains. But, then it collapsed. That crash left traders with larger losses. Some experts believe it also contributed to the sell off in the S&P 500. Hedge funds and other large investors had significant exposure to the volatility market. These markets are based on the Cboe Volatility index, or VIX. Although VIX cannot be traded directly, it can be accessed through exchange traded notes like XIV and other exchange traded products along with futures contracts. In addition to those products, traders also had access to options on those products and large traders had access to customized derivatives. All told, there may have been trillions of dollars in the volatility markets. The large move created both winners and losers, and they could all be rebalancing. Funds with large gains could be shifting assets away from volatility trades. They might be buying stocks, or they could be reducing exposure to stocks because they are concerned about additional declines. The same could be said for funds with large losses. They could be adding to or reducing their exposure to stocks. This creates a volatile situation for all markets but especially for the stock markets. It seems likely that traders will be repositioning their portfolios. But, that is all that appears to be certain. Whether the repositioning will result in buying or selling, on net, is impossible to determine. But, traders can still find value in knowing that there is likely to be a large amount of trading, even without understanding the likely direction of the trading. They can take a position based on the position that the rebalancing is likely to lead to changes in the price of the major market averages. That is a tradable market outlook and could be used to open a position that can deliver potential gains with limited risk. To trade this idea, we could trade options on the SPDR S&P 500 ETF (NYSE: SPY). Other index options could also be used but the SPY is among the most liquid markets and likely to be traded with little friction or trading costs. The straddle can be opened using options expiring on February 23 with an exercise price of $266. The February 23 $266 call is trading at about $3.50. The February 23 $266 put is trading at about $3.25. The total cost to open the trade is about $6.75, before commissions which should be relatively small at a deep discount broker. The total premiums add up to about 2.5% of the price of SPY. The question is whether or not a move of that size is likely within the next few weeks. Given the current state of the market, it seems to safe to assume that a significant price move is likely. Whether that move is up or down, this trade could profit. 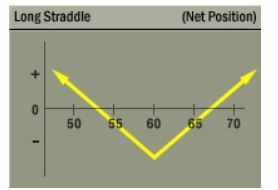 The long straddle is an example of how options are a versatile tool and could meet many of your trading objectives. In this trade, options provide the potential for gains and defined risk that could be lower than owning the stock. This trading strategies should also have a high probability of success.